The "Durham Auditorium" was the grandest theater in the age of downtown theaters, transitioning from live performances / to moving pictures early on. Spared the wrecking ball in the 1960s, it is the only downtown theater that survives - as a center for independent film, live performance, and movie festivals. "Headquarters of the Donald Duck Twin Club of America!" Who knew. Was this club for fraternal twins? Or for people whose donald duck voice was so good they could be mistaken for his twin? GK, I'm headed down south for Carnival and wish you were coming. I'm marching in the St. Anne's parade on Tuesday, dressed as McKenzie's "Chicken In A Box" (the famous bakery in Gentilly that was one of the first businesses to reopen after Katrina and sustained most of us during the long weeks of animal rescue work). Isn't that awesome? I think the CT should certainly highlight its august history as the DDTCoA. Hope you have a great time in NO. I'd love to be there, but will be at conference this week - which sounds lot less fun than chicken-in-a-box. 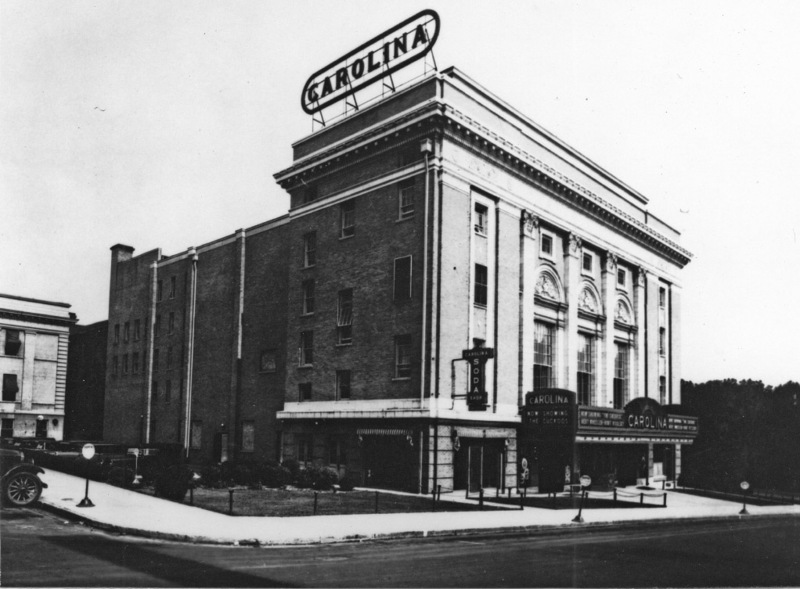 During the Carolina's 80th birthday party celebration, Pepper Fluke said that in the 1940s the theatre management took down the flashing light marquee because it too closely resembled a Japanese rising sun. By the way, that 1920s aerial shot is fantastic -- what's the source? Thanks for the extra info about the marquee - I love the original one, and the big "Carolina" sign on top. I appreciate you noting that I forgot the credit on the aerial. It is from the Duke Archives. wow. parking lots ruled in the 60's and 70's - so amazing how many buildings were leveled from the 1920's to the 1970's. what's on the south side of the CT now??? is there a donald duck banner out there anymore? A few years ago I went to the Grady Tate jazz festival at the Carolina Theatre. In one of his stories, he recalled his youth and carrying/helping his grandmother up many flights of stairs to the "colored section." He said, "And I swore to God -- or some other white person -- that I would never come to this place again..."
Thanks for adding your comment. Beautiful architecture is no bulwark against bigotry, as so many of our early 20th century structures in downtown were segregated by the people who owned/leased them. I hope, time and energry willing, to provide a far more detailed accounting of Hayti in the future, including the Regal, the Wonderland, and other theaters that thrived in the segregation era. Parking lots did indeed rule - there were many before urban renewal (which took out almost everything on Morgan St.) and many, many more after. No historic Donald Duck Banners that I know of on the CT. The south side is mostly obscured by the movie theater addition of the late 80s-early90s. Somehow, I don't think the Carolina was the only "headquarters." There are TWO new movie theaters in the building south of the original Carolina. Two new + one old = three. 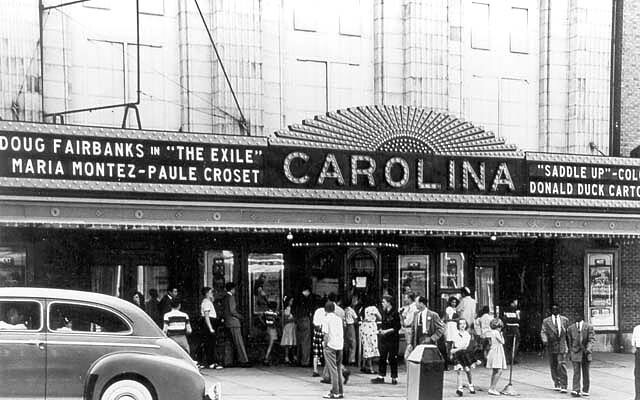 I've always loved the Carolina Theatre and wondered about its past and place in Durham . This is phenomenal! Thank for your work uncovering and documenting the history of this great city. This collection of photos finally clarifies for me how the Carolina was originally situated with regard to streets no longer there. Thanks so much for assembling it. 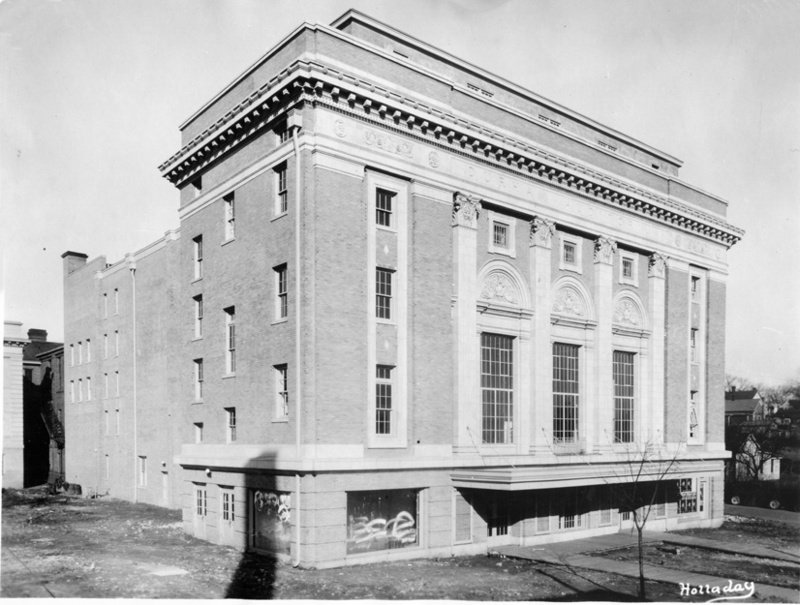 The Durham Auditorium, designed by Milburn and Heister of Washington D.C., was constructed in 1926 as a replacement for the "New Academy of Music" which was destroyed to make way for the Washington Duke Hotel. As detailed in my post about the first Durham High School/City Hall, the Durham Auditorium was attached to that building, which was remodeled by Milburn and Heister to match the style of the newer buildling. 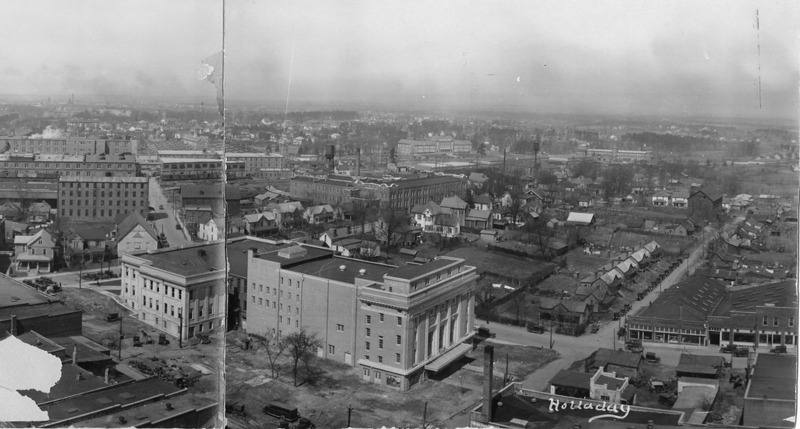 This shot, taken in the mid 1920s, shows the Durham Auditorium either during or immediately after construction. (It appears the site around the building hasn't been completed.) Many other interesting sights are visible in this shot -the large houses lining Morris St. north and south of the Imperial Tobacco building, the modest housing on Roney, the new Durham High and Carr Jr. High in the distance, and more. The theater showed a mix of live performances and movies. This shot from 1930 shows the original marquee, which (although the resolution is too poor in this digitized version to see it) says the theater is showing "The Cuckoos". The sign to the left of the marquee says "Carolina Soda Shop." 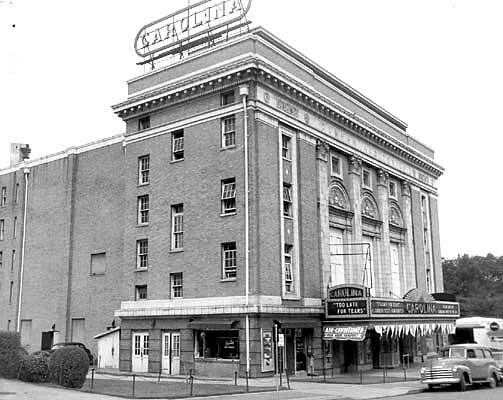 The auditorium appears to have been called the Carolina Theatre from a fairly early point in its existence, perhaps to highlight the movie showings, which, over time, began to increasingly dominate the theater's programming. This shot from 1947 gives a closeup of the marquee. Three shots from 1949 may be overkill, but I find them all fascinating, so why not. "Movie Stars in Town" - 01.11.57. Bob Nocek and Jim Carl at the Carolina were kind enough to identify John Saxon, and, most likely, Luana Patten - co-stars of "Rock, Pretty Baby" doing publicity for the opening of that film. The Carolina was segregated; African-Americans were only allowed to sit in the balcony. I have read that this was sometimes referred to as "buzzards' roost" - a name evidently also given to the corner of McMannen and Pettirew Streets. During 1962, a rolling 'line protest' went on for months, as African-Americans would attempt to buy tickets to the whites-only section and, when refused, would return to the back of the line to try again. I believe the theater was desegregated in 1963. By the 1970s, the management of the theater shifted to the Carolina Cinema Corporation, a non-profit group that focused on showing foreign and independent films. Below, a shot taken from the CCB building by Ralph Rogers around 1986 shows the Carolina Theatre, Roney St. and the surrounding area just before it was drastically changed by the construction of the Omni, Convention Center, and the People's Security Insurance building on Morgan St.
Below, looking south from the closed Roney St. in front of the theater, the convention center is being constructed., 1988. By 1989, the plaza is essentially completed, and the Carolina Theatre was closed for renovation. It's very fortunate that the Carolina Theatre dodged the parking lot-bullet aimed its way in the 1960s. It is, in my opinion, the crown jewel of Durham's architectural heritage. I do feel that its energy is diminished by the configuration around it - the strange plaza, the Loop, the parking garage, the odd orientation of the hotel entrance, etc. It's configurations like these that make me distrustful each time Durham says they are going to build a new, grand project. The plaza and Carolina Theatre, looking south, 2006.